John has been a busy sawyer lately. Word of mouth has directed several guys to bring tree trunks to our place for John to mill. John’s lumberyard (literally, the part of our yard dedicated to lumbering) smells sweetly of fruity sawdust. Today’s project was to mill a mantelpiece. Originally thought to be pine, the wood turned out to be sassafras. The pleasant surprise meant milling the rest into boards for woodworking rather than 2×4’s for more mundane use. Outer frame is not very full; best to leave it all for the bees. I’d have taken a photo of the meal, but was too busy eating it. Technically, 5:20 a.m. isn’t night. But it’s dark enough for a six year old to ask his mom, “When is the sun going to let us know it’s morning?” And it’s morning enough for John to be getting out of the shower. But it’s dark enough for me to still be completely comatose. That was no squirrel cavorting in the attic. Something big landed somewhere. John heads off for his men’s Bible study but returns later to search the property. House–check. Bees–check. 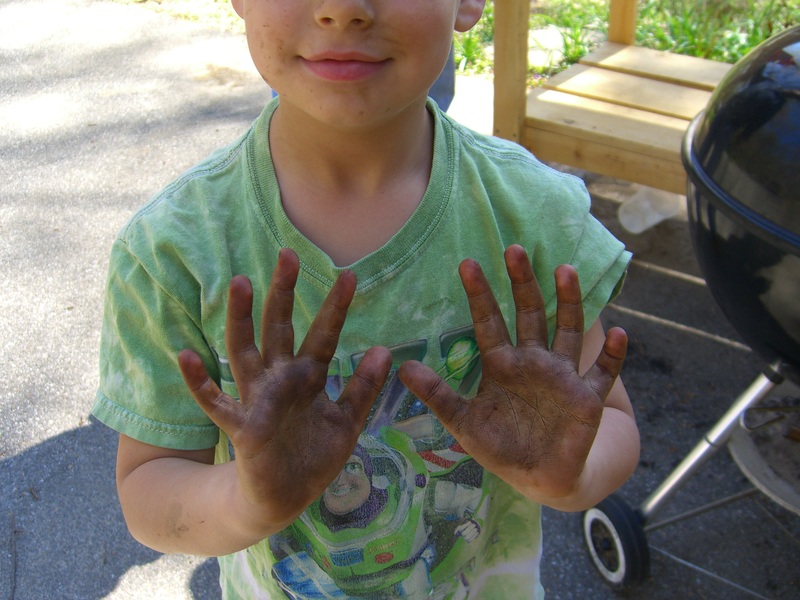 But his parents inform him that the “whump” was at their place next door to us. A huge part of a tree fell, fortunately onto an empty parking area. Alas, poor tree. Great-great-grandad Maynard said that the tree was a seedling during George Washington’s days. For years it proudly bore the sign that announced that it belonged to a tree farm. A beautiful tree, arching in three grand sections, one section had died and had been cut off. The whole tree should have gone, but sentiment prevailed and now a second chunk has fallen. The remaining tree is completely lacking its former grandeur and dignity and will need to be felled. John’s sawmill has been busy lately. A friend from church lost a big tree which has now been cut into usable boards. The George Washington tree will be next. And after that? Well, there are more trees that need to come down. There are two trees on the west side of our house that should have been felled when we dug the foundation for the house. 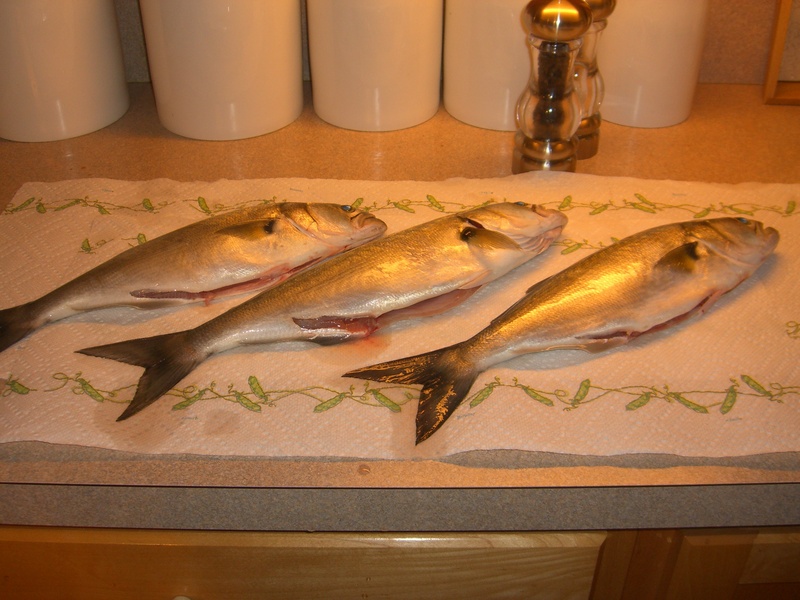 About two weeks ago, a big chunk fell from one of them onto the roof of the screened porch. “Craaaaaak! Whump! Thunk!” It bounced off the roof and thumped into the hydrangeas. It scared the beezeebies out of me, as I had just left that porch to come inside when the branch fell. The trees have to go–even if we have to pay someone to take them down. That, dear readers, is a wife throwing down the gauntlet to her husband: take down the tree or I will spend money to get someone else to take down the tree! Fortunately, dear husband is on the same page and has three additional trees on his radar for removal. If they aren’t a danger for dropping branches, they are a nuisance in facilitating squirrel access to the attic. Most people don’t want to be “typical.” Amercians, at least, think they are too individualistic to be “typical.” Especially Americans who go for the rustic, in-the-woods-log-cabin lifestyle. But you know what’s typical for people who build houses on wooded lots? They want to preserve all the trees. Every last daggone tree. But then, after a few years in their wood-surrounded house, they get tired of squirrels jumping onto their roofs and mold growing on the house and grass not growing. They start to appreciate things like solar heat and the ability to grow house plants. And then some trees have to go. I walked around the house today staring up at the trees that need to go. There’s a lot of sunlight behind them. I’m thinking this former beach girl stands half of chance of catching some rays. Once the sun comes up, of course. Here at Maywood, there’s the back yard and then there’s what’s beyond the back yard. 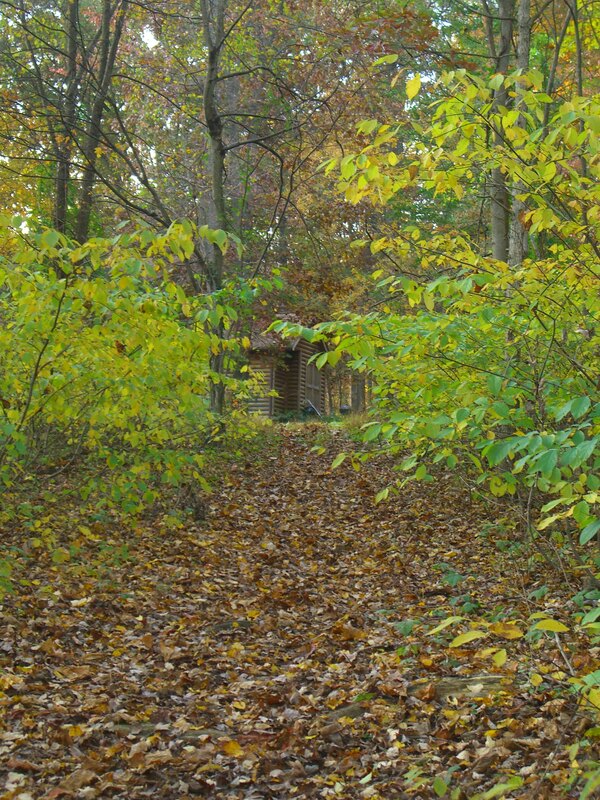 That is John’s territory–down the hill and into the woods. It is not visible from the house. This is very important. If I can’t see it, then I can’t yell about what it looks like. Periodically I get invited back to see projects in progress. This often involves hiking through vines and low-hanging branches while avoiding tree roots and other tangly things. Every once in while paths get mown, but usually a walking-stick is recommended (new hip or not). 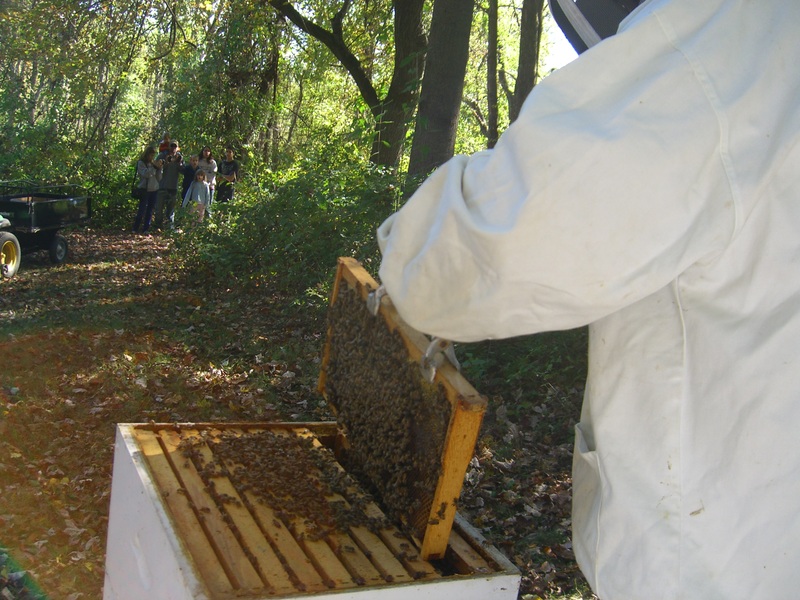 The best worn path is the trail to the beehives. It’s unofficially known as Beehive Lane. Sunday’s trek had us observing Japanese maple saplings springing up along the trail. We always check to see if the maples saplings are the cut-leaf variety, since there are a couple of very old cut-leaf maples at the Maywood house. Little holly trees abound too. Over the tree roots and down the hill toward the highway, we wend our way to the bees. Two hives are active, one much more so than the other. The bees report back to the hive like planes coming in for a landing. The smaller hive is like a regional airport. Bees fly in and enter one at a time in evenly spaced entries. Imagine a little bee airport controller calling them in. 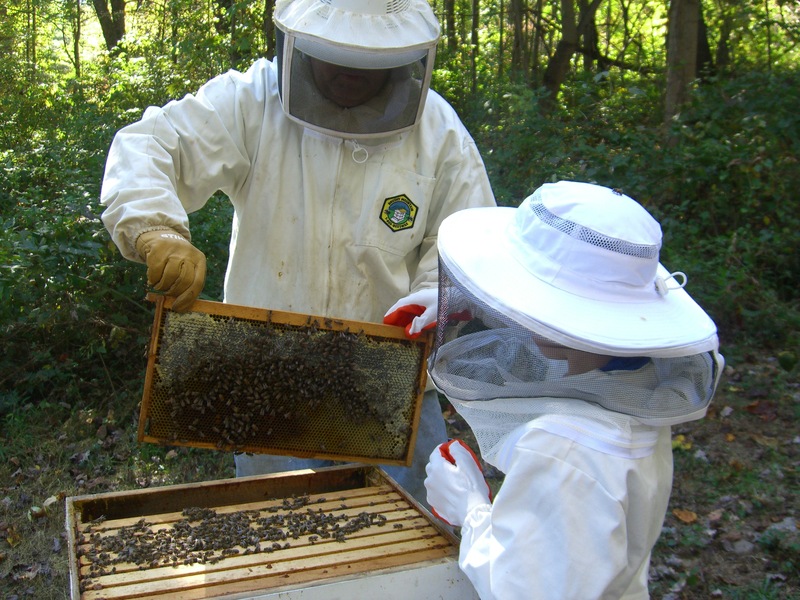 The other hive is like JFK Airport in New York–bees are coming back quicker than they can get in. They don’t circle for a landing, though, they all just bunch up at the entrance like a bunch of travelers trying to get the best seat on a Southwest flight. 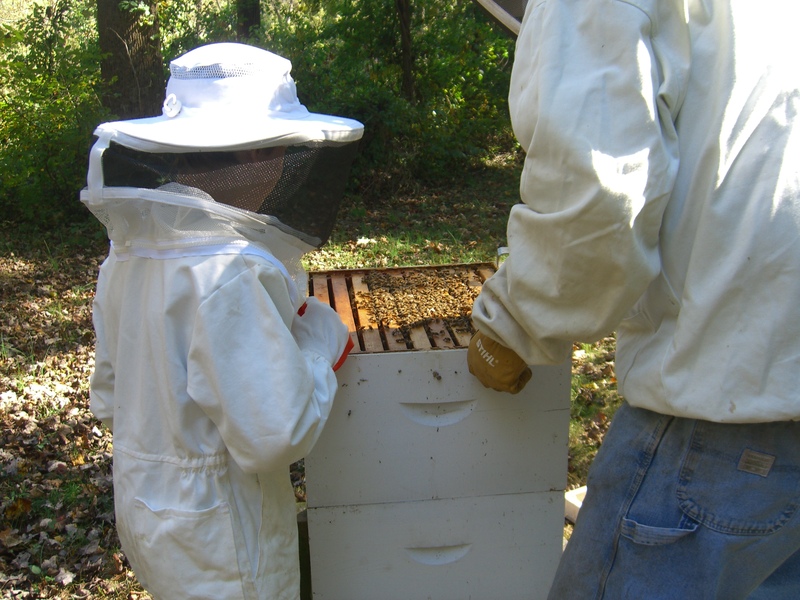 The good news for us is that they all have bags to check, which will result in honey for us. Another path is the Sawmill Lane. 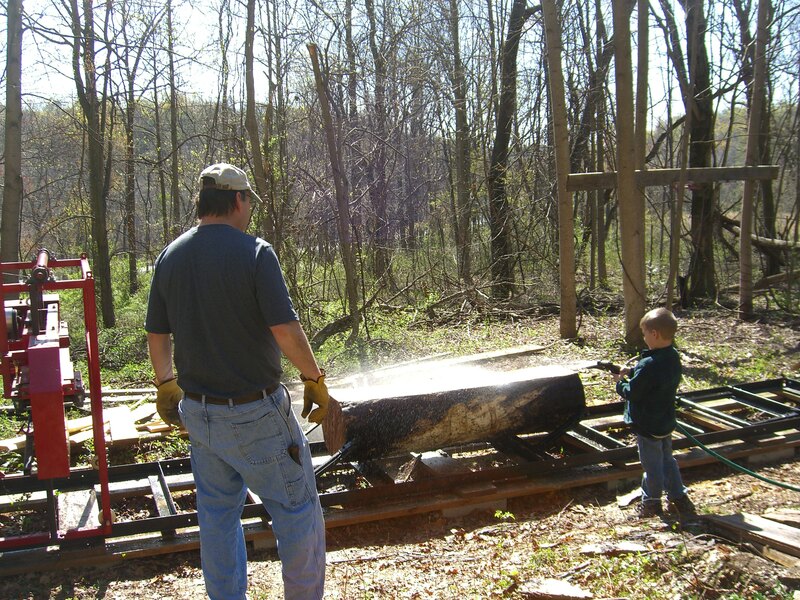 That takes you to John’s sawmill and cut trees and boards and sawdust. This is also where he butchers his deer. It’s really best that we not see this area. 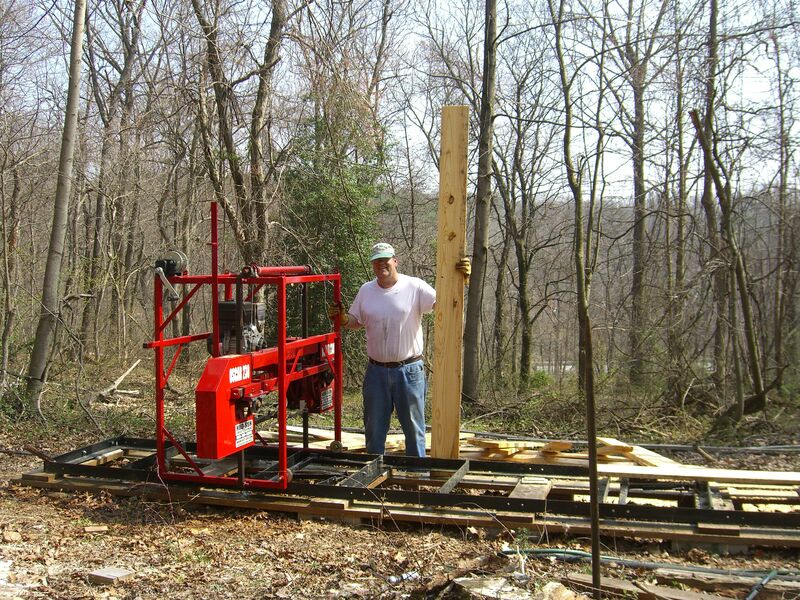 When he first got his sawmill, he set it up in the middle of the backyard. 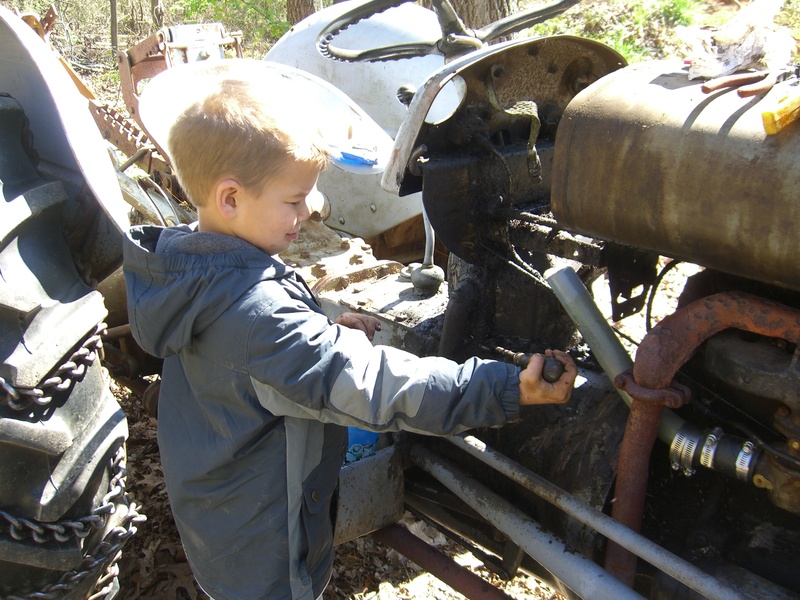 That went over like a lead balloon, so he moved back into the woods where he can play without my complaining. 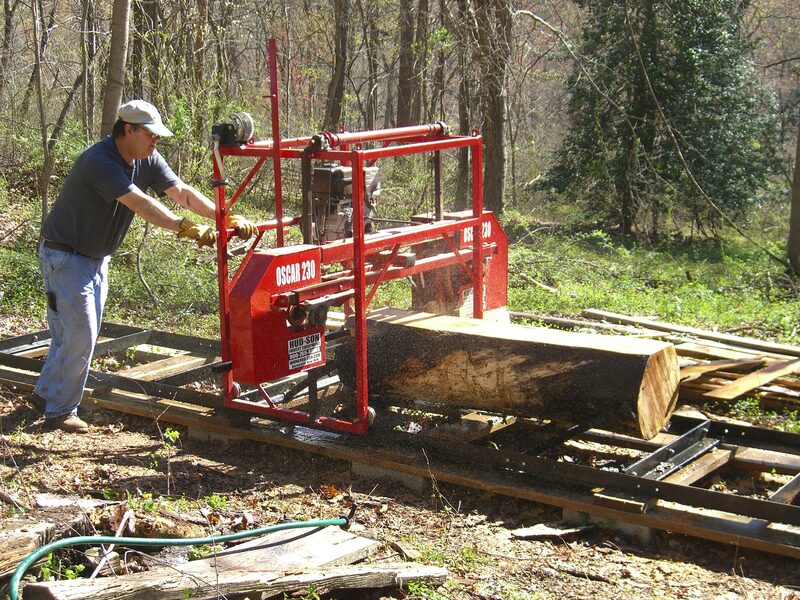 Lately, John has been milling a large black cherry tree that is destined to become a fold-up bar for Chris and Julie. Yes, he is actually working on their wedding present and may even have it finished before their infant daughter gets married. At any rate, it smells like fresh cut black cherry wood down there and it is taking on the appearance of a large outdoor shop. Sunday’s trek–good thing I had my walking stick–took us way down the back forty to the site of the actual tree that is the source of the current project. I suppose one could get lost, but “down” takes you to the highway and “up” takes you to the house. Still, I did appreciate seeing the big holly tree as we made our way back up. The holly tree stands at the “corner” of Sawmill Lane and HollyTree Lane which leads to Beehive Lane. We took a left onto HollyTree and merged into Beehive Lane which took us back up to the house. Well, that’s what was in my brain, anyway. You might have just seen woods.